Charles: Would you like a cocktail? 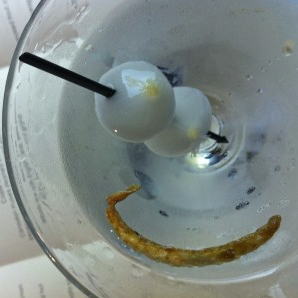 Madame Arcati: If it’s a dry martini, yes! If it’s a concoction, no. Charles: It is a dry martini. I played Madame Arcati in 2006. Oh, we had such fun! Over on a Month of Smiley Silliness it is the beginning of Salute to Moms Week and Mothers’ Day!! It’s Dance Like a Chicken Day. There’s nothing quite so good for lifting your mood as dancing is, regardless of whether you imitate a farm animal or not. I once played Henrietta, the singing and dancing chicken in “Honk.” And for a little dancing inspiration here’s a playlist of some very danceable, singable songs which always make me happy! Skylab launched, on this day back in 1973. It was quite an achievement, even if a bunch of stuff went wrong. I loved reading about the experiments going on up in space. Plus the photos it sent back were amazing! Today we say happy birthday to George Lucas (1944), Cate Blanchette (1969), and Mark Zuckerberg (1984). Would you believe it if I told you there’s a book where my smiley story is sandwiched in between stories about birthday boy Mark Zuckerberg and Steve Jobs? No lie. Check it out.